Huge GARLIC EARRINGS - Gothic Dracula Vampire Deterrant Slayer Hunter Talisman - Garden Herb Root Vegetable Medicinal Plant Costume Jewelry - Legend to ward off evil spirits Twilight Supernatural Vampires - Cool classic Goth accessory for any Halloween Party, Dark Shadows, Buffy Collector fan. 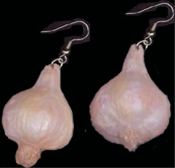 Mini dimensional, detailed, realistic, miniature fake garlic cloves. Lightweight paper-coated styrofoam. Each bulb a little different, approx. 1.5-inch long x 1-inch wide. Also great for chefs who cook Italian food!